Teatru Astra, with the support of Bank of Valletta, is proud to announce the fourteenth edition of Festival Mediterranea, a series of cultural events to be held in Gozo between the 20th of October and 6th of December 2015. This year's festival was officially launched during a press conference addressed by Mr Charles Borg, Bank of Valletta CEO, Mr Michael Formosa, Chairman of the Festival Mediterranea organizing committee and Prof. Mro Joseph Vella, the Artistic Director of the Festival. Charles Borg spoke about the importance of such culturally-enriching events. 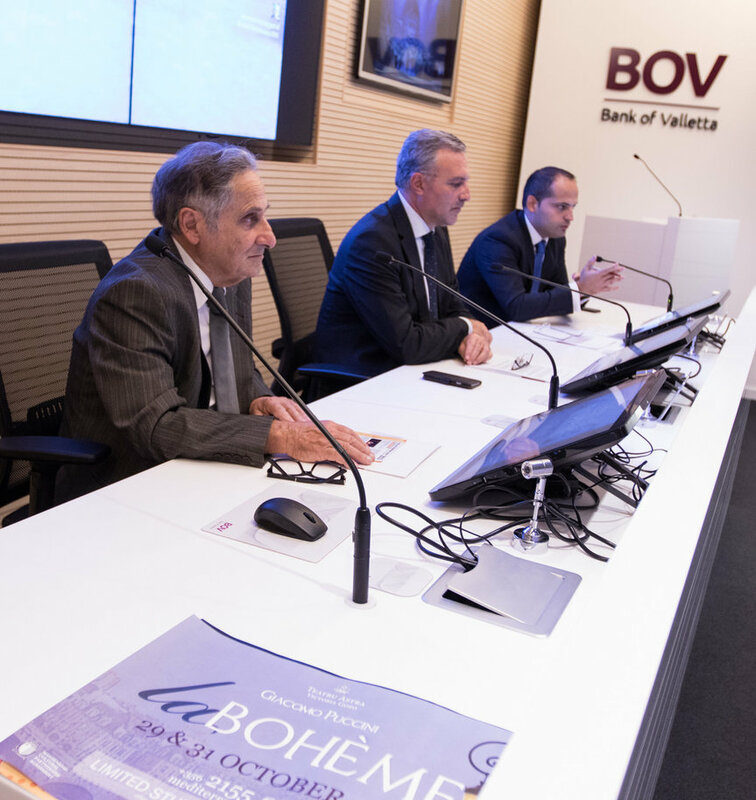 "Bank of Valletta is proud to give its backing to initiatives like Festival Mediterranea. This event, which the Bank has been supporting since the first edition in 2002, has grown to become a celebration of the Mediterranean culture." Speaking about the Bank's involvement in the community, Mr Borg explained, "Through the cultural pillar of its Community Programme, the Bank is not only promoting greater awareness of the arts among the public, but also giving an added boost to the local economy as the eight week-long festival creates activity at a period which is off-peak, thus injecting a much-needed vitality on the island." Michael Formosa, the Festival Chairman, registered recognition of the work of a large number of volunteers ─ including a many young people ─ involved in the artistic, technical and administrative aspects of the festival, and specifically, of the opera production. He stated that Teatru Astra, whilst being grateful for the vital corporate support and state funding, is still reliant on the voluntary work of many people in the community. He also made reference to the ambitious festival programme of events being announced. He also highlighted the opera workshop which is being organized at the Manoel Theatre on Tuesday 20 October in collaboration with the management of the same Theatre. Mr Formosa made special reference to the fact that the set and scenery of last year's Nabucco at Gozo's Teatru Astra was chosen for the production of Verdi's same opera two months later at Rimini, Italy. He noted that this is arguably a first in the history of opera in the Maltese islands. He concluded his address by announcing Giuseppe Verdi's majestic AIDA as the opera chosen to be performed next year, on 27 and 29 October 2016 at Teatru Astra. Prof. Joseph Vella highlighted that La Bohème is one of the most beautiful operas composed by Giacomo Puccini. He explained that this is another opera that promises to be one of the highlights in the well-established tradition of excellence at the Teatru Astra. A fantastic cast of solo singers and formidable choral support, all in the ambit of outstanding sets and scenery, promise a truly operatic night to remember. As in previous years, this year's pride of place in the programme of events goes to the production of the opera. For this year's La Bohème, Teatru Astra engaged Italian tenor Leonardo Caimi for the role of Rodolfo, local soprano Miriam Cauchi for the role of Mimí, baritone Devid Cecconi to interpret the role of Marcello, bass Gabriele Sagona for the role of Colline, and Romanian contralto Oana Andra for the challenging role of Musetta. Another local talent is that of Louis Andrew Cassar, who will be singing the role of Schaunard, while Miguel Rosales will interpret the roles of Benoit and Alcindoro. The opera will be performed twice, namely on Thursday the 29th and on Saturday the 31st of October at 19.30hrs. A special event associated with the production of La Boheme will be held on Tuesday the 20th of October at 17:30 at the Teatru Manoel Studio Theatre in Valletta. The event consists of an opera workshop with the participation of the artistic director of the production, Prof. Enrico Stinchelli, the musical director Prof. Joseph Vella, and the world-famous soloists who will be taking part in La Bohème. This event is free of charge. Other cultural events include a recital on Friday 30th of October at the Kempinski San Lawrenz Resort and Spa, featuring soprano Arienne Gaerty and pianist Julia Miller. There will also be two public lectures, by Dr Abraham Borg and by Dr Mark Sagona, on the mornings of Saturday the 31st of October and of the following Saturday, the 6th of November, respectively. The Gozo Theatre Club will stage Oscar Wilde's De Profundis, directed by George Mizzi, on Saturday the 14th of November, while the management of the Teatru Astra will stage Arthur Miller's A View From The Bridge, directed by Mario Tabone, on Saturday 5th and Sunday the 6th of December. This year's programme of events also features a seminar on the historic and cultural contribution of local bands, addressed by Prof. Joseph Vella, together with speakers Prof. Vicki-Ann Cremona and Ms Anna Borg Cardona, to be held on Saturday the 14th of November at 10:00 at the Ministry for Gozo, and an exhibition with the same theme set up at the Teatru Astra. The La Stella Philharmonic Band presents its Annual Grand Concert on the following Saturday, November 21st, at the Teatru Astra, and will perform music by Prof. Joseph Vella who is marking the 45th anniversary at the helm of the Band. Moreover, as part of Festival Mediterranea, between 23rd of October and 15th of November, an exhibition Art Genius From Father To Daughter, featuring works by famous artist Mario Caffaro Rore and his daughter Adriana, will be set at Il-Ħaġar│Heart of Gozo museum in St George's Square, Victoria.